Los Angeles, CA—As most of my readers know I loathe the Marxist agenda of the Obama Administration. For those who suggest this is related to the color of his skin, I freely admit I despise Barack Obama, but only over the Red color of his politics. As for skin color, it has no significance to me. Conservatives blast Liberals over the Death Penalty. Hard corps Socialist and Communists like Hitler, Castro and Stalin has a solid history of branding their political enemies as criminals and executing them by the millions. Barack Obama has never taken a public stand against the death penalty. Is Obama capable of using that awesome power to kill his political enemies? Why must we wait and find out? This power needs to be taken away from our government. Sooner or later all governments abuse the death penalty and history teaches this reality redundantly. During my early years in law enforcement murders were routinely cleared at the 85 percent level. Nearly 40 years later the murder clearance rate has stalled at 35 percent. That seems crazy since today we have the refined investigative tools of DNA, high resolution surveillance cameras and nearly every American leaves a constant data trail with every purchase or trip on a toll road. Add to that that data can be cross checked with the surveillance video and absolute alibi evidence can often easily be established. Notoriously unreliable eye-witness identification has been all but phased out by modern technology. The inescapable conclusion is that we have imprisoned and killed thousands of innocent people in America because of a flawed criminal justice system we love to boast about. We can get along fine without the death penalty and save billions for the legal appeals our justice system demands. It’s far cheaper to keep people locked up for life or until they're too old and infirmed to cause harm. If Barack Obama was really a simple Liberal he’d have condemned the death penalty long ago. Obama is not what he has been advertised and should not have the ultimate tool of tyranny. However the 100th wrongfully convicted person that was exonerated by DNA has just been released. .
As a Christian I can not oppose the death penalty, as it is Biblical. Gods way bigger then mine. 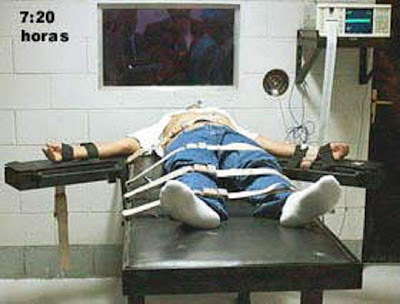 However because of Obamas confirmed socialist and dangerous agenda, I an no longer an advocate for the death penalty. In the past, I have supported the death penalty on the grounds that I don't trust politicians who might someday decide to let deadly felons loose again into society. Paul, you've mounted some good arguments here and earlier against the death penalty but I must add that what California is about to do just renews my conviction that politicians are not to be trusted in this regard. But as Redlands PI also points out, with new DNA tests undoing earlier convictions, it only makes sense to conclude that innocent persons may be put to death. My bottom line must be to cast my votes as carefully as possible for those who are most capable of making such judgments, and to then accept they are doing the best anyone could do. Whether they opt for the death penalty or grant early releases to dangerous criminals, the world remains a dangerous place.